Para comemorar a chegada da Primavera (minha estação preferida) aqui no Brasil fiz esse Kit Spring . 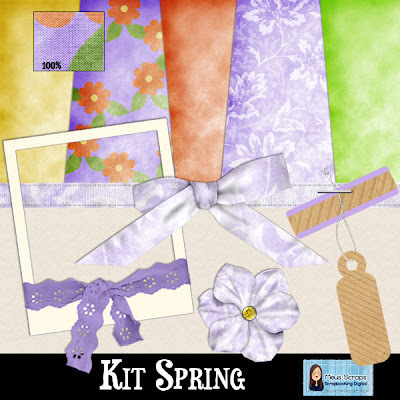 To celebrate the arrival of the Spring (my favorite season) here in Brazil I made this Kit Spring . I hope that you like . TY so very much for the lovely kit!!!! LOve the colors and purple patterns. Absolutely beautiful! Especially I love the purple lace! :) Thank you very much! Thank you very much! Absolutely wonderful! This kit is beautiful! I loe the colors! Thank you for sharing it with me! thank you very much beautiful kit. These papers and elements are so pretty. They are definitely very spring-like. I love them. Thank you so much! Very pretty. Fall just arrived here =) Thanks for sharing.